Ginga Kogen American Pale Ale is a 5.5% American pale ale from Ginga Kogen Beer, based in Iwate, Japan. It’s part of their seasonal range though which season that is is unknown as the Seiyu supermarket in Japan have an exclusive deal with Ginga Kogen Beer to sell it in cans. Ginga Kogen American Pale Ale is brewed using exclusively American Cascade hops throughout brewing. It’s also brewed with two different kinds of malt – a 2-row American malt as well as some caramel malt too. Urgh – I know it’s unfiltered but it really does look that bad. Ginga Kogen American Pale Ale poured out a murky orangey brown colour (pretty much the colour of Donald Trump’s tan) with a slight off-white head. It really didn’t look right until I read the side of the can which mentioned that this beer is unfiltered and contains yeast from the brewing process so that haziness is the sediment – thanks for the warning! A first time for me to have an unfiltered American pale ale. It had a distinctly yeasty peach citrus aroma that reminded me of peach juice. There was no distinct aroma coming from malts at all, and the head still hadn’t gone down by this point. I should have brought a straw to get through the head, as by the time I started drinking Ginga Kogen American Pale Ale, it still hadn’t begun to go down. The peachy yeasty body was not really that nice or welcoming, with it’s harsh diacetyl flavours peaking through some peculiar sweet caramel lemony bitterness. I don’t know how the peachy flavours came to be in this beer – perhaps either the fermentation was too low, or they used a different strain of yeast – but it wasn’t nice to have it throughout drinking. It finished off with some hints of bitterness and frutiness but by that point, I didn’t want any more of it. Ginga Kogen American Pale Ale is not a decent American Pale Ale and you shouldn’t be swayed by it nor the cheap price point. 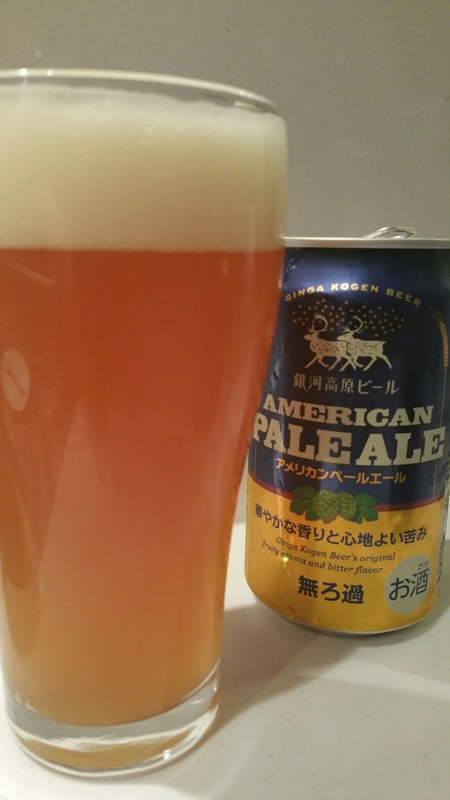 Ginga Kogen American Pale Ale is an exclusive beer sold in Seiyu stores across Japan. Shite beer. Drain pour every time for me.